Evolution Aqua are proud to announce the development of a range of new ultraviolet lights. 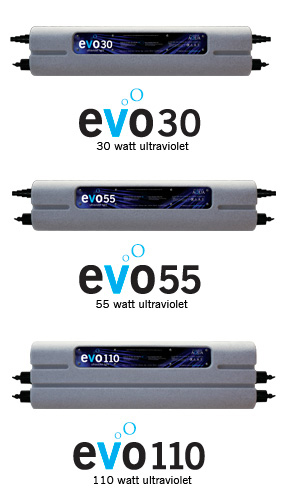 Evolution Aqua are developing a brand new range of ultraviolet lights, named the evoUV. The evoUV range looks set to take the pond world by storm when they go on sale early next year. The evoUVs were officially unveiled at October’s AQUA 2010 Show in Telford. They were met by a genuine sense of excitement amongst aquatics dealers, and we are sure that once Koi keepers and water gardeners see the evoUVs for themselves, they will be impressed too! At the AQUA 2010 Show, Evolution Aqua displayed two prototype models of the evo55 and the evo110. It has to be said that they looked really impressive, giving a full representation of the finished product. The styling of the models has a contemporary look, and they will sit perfectly alongside Evolution Aqua’s current range of filters, complementing them for style and quality. There are three bulb sizes that make up the evoUV range. The evo30, incorporates a 30 watt UV bulb, the evo55 contains a 55 watt bulb and the evo110 houses two 55 watt bulbs. This broad spectrum means that many pond owners will be able to add the new UVs into their current set-ups. Thermal safety protection means that the unit will switch off if it overheats. Integrated power and bulb life indicator. All three evoUVs feature an integrated power and bulb life indicator meaning there will be no doubt when the UVs are working, and when the bulbs need to be replaced. To be specific, the bulb will glow a purple colour when the power is on, it will then flash when the UV bulb is nearing the end of its life span, and then the indicator will glow red when the lamp needs to be replaced, after approximately 9000 hours or about a year. Even if the UV is turned off the internal chip will remember how long the bulb has left to run.